At the end of each season, the Novato South Little League selects players to receive the Ed Hamann Sportsmanship Award. The award is based on good sportsmanship, a positive attitude, a willingness to help others, and being a team player. It has been presented to Little League players in Novato since the 1970's. 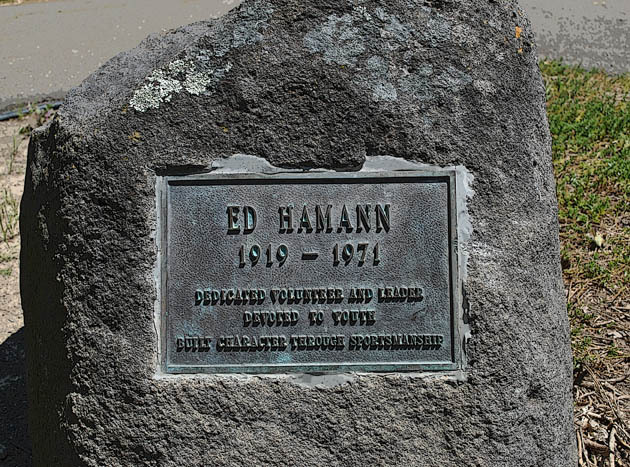 Ed Hamann (1919-1971) was a long-time Little League and Babe Ruth coach in the 1960's and 1970's in Novato. In addition to coaching, he was also a volunteer firefighter in Novato and a Seabee in World War II. After he passed away in 1971, the Olive field was built in 1972 and named after him. The good sportsmanship award was created soon after that and was also named in his honor. It has been an integral part of Little League every year. In the Major League, all 12-year olds, 2 coaches per team, and each manager all vote for a 12-year-old Hamann winner not from their own team. The highest vote getter from each team is recognized, as is the overall winner. In the Minor League, each manager selects one player from his or her team to be the team nominee, and then the managers meet to vote on the Minor League winner. The Novato American Little League (NALL) merged with the Novato South Little League in 2012. Novato South Little League is pleased to share the names of all of the previous NALL Hamann Award Winners as well dating back to 1972 when the Hamann Award was first presented.